OK, this is the clincher: Rachel Maddow was right, and the Cain campaign is performance art. I just can't wait to see how the Saudis react when they find out they aren't in the top SEVEN middle east countries under Cain's rubric of importance. Except the "Reagan Worldview" was clearly a parody. And this, the candidate's formal statement, makes the Reagan parody look like the nuanced view of a great statesman. Which, by comparison and whatever one thinks of Reagan, he was. Scary in both the depth of ignorance shown and how simplistic a worldview it displays. 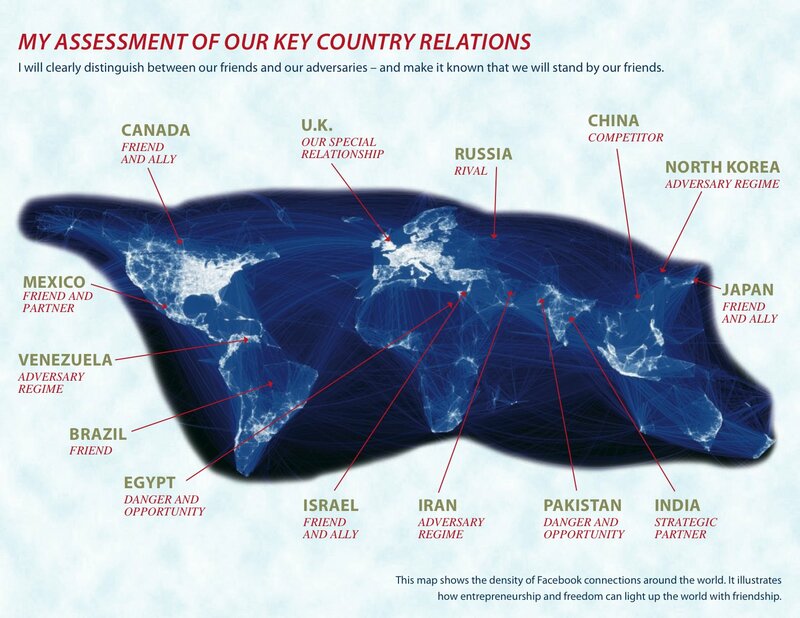 My favourite thing about that map is that it shows Facebook connections. Definitely the most informative part of the graphic. Okay, granted that this is a simplistic worldview, and if it indicates the extent of Herman Cain's thoughts about foreign policy, then it's damning. But, on the other hand, when I first saw the graphic, I thought that it didn't represent every nuance of Cain's thinking, but rather an attempt to reach a web audience with something that is easily comprehensible. In other words, it's dumbed-down for the audience it's trying to reach. Think of it this way: if you took a survey of the voting public and asked them to correctly identify for each of those countries listed its relationship with the U.S., what percentage could do so? I'd say 10%, but certainly well less than a majority. That being the case, it makes sense to present foreign policy stands in this "primer" form. You're a generous man, Robert. Personally, I think anyone actually interested enough to want to know Cain's foreign policy stances would already apparently know more than he does. Primary voters are an opinionated lot, and they may not all be geniuses, but they probably mostly know where Brazil is, and if they don't, I doubt the designation of "friend" will educate them much. All praise due to Koger.